Solar-Vision Publishing/Copyright 2009/40 pages/Softcover/BRAND NEW!! 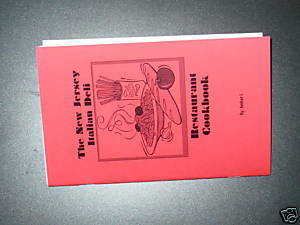 Have you always heard of the wonderful food like MOUTH-WATERING subs, BUTTERY pastas,ICY beverages, FRIED appetizers, AUTHENTIC Italian desserts, CRUNCHY salads,and italian dishes..BAKED TO PERFECTION... that harbors the East Coast..and have long since made the east Coast famous? Or have you lived on the east coast, and have moved, noly to notice that food anywhere else isn't the same? MISCELLANEOUS....Ravioli Dough,Ravioli Filling,Stuffed Rigatoni,Ricotta Or Cottage Cheese Filling,Meat Filling For Stuffed Pasta,Italian Dressing,Oil Dressing For Subs,Tom's River Ranch Dressing,Home-Style Ranch Dressing,Marinara Dipping Sauce,Pizzaiola Sauce,Foccacia Bread,Fresh Homemade Pasta.......AND Italian Food Ingredients Guide!! !